So drip cakes are super popular right now and a giant melting ice cream cake with an amazing gravity-defying waffle cone is an awesome excuse to use the drip technique in a fun way! The only thing more fun than a bright, colorful birthday cake would be ice cream to go with the cake. So we created a cake tutorial that puts the ice cream on top of the cake. Although it looks melted, it will hold up and keep it’s cool design far longer than real ice cream. 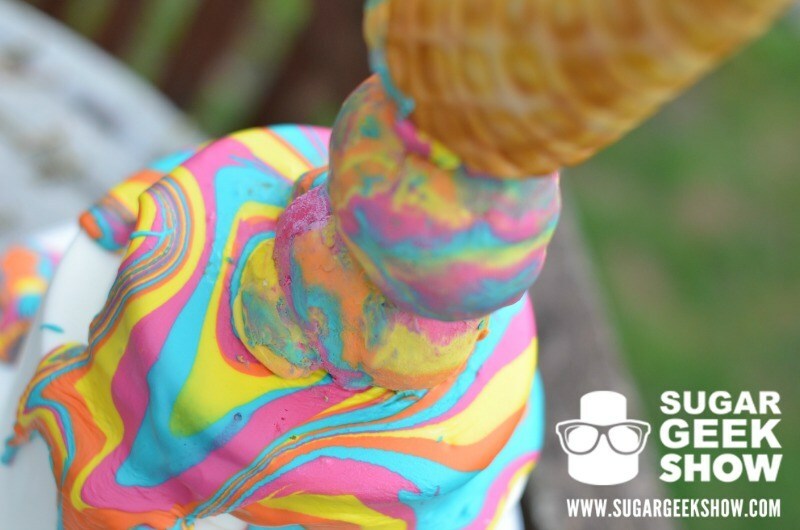 This cake looks like a giant ice cream cone flipped itself over onto the cake and is melting into a rainbow of deliciousness. It doesn’t get much more fun than that and this technique is easy to pull off! Also, the best part is you don’t even have to clean up the mess or listen to any heartbroken crying children. You can mix up the colors and even add extras to customize the look to your theme. Ombre maybe? Let’s not forget that this design is also gravity-defying which is another awesome factor that can be used in many different cake designs. Any time you can use vibrant colors, you should! 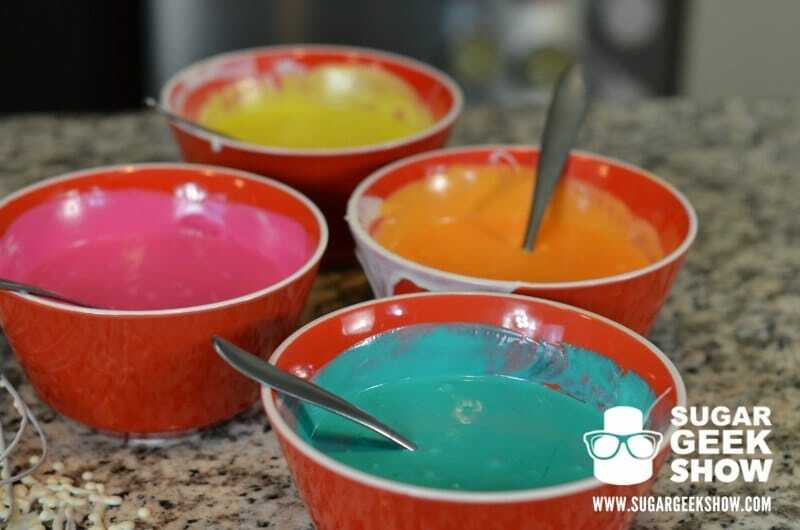 Bright colors add so much interest to a cake design and really make it pop. Just check out that eye candy. 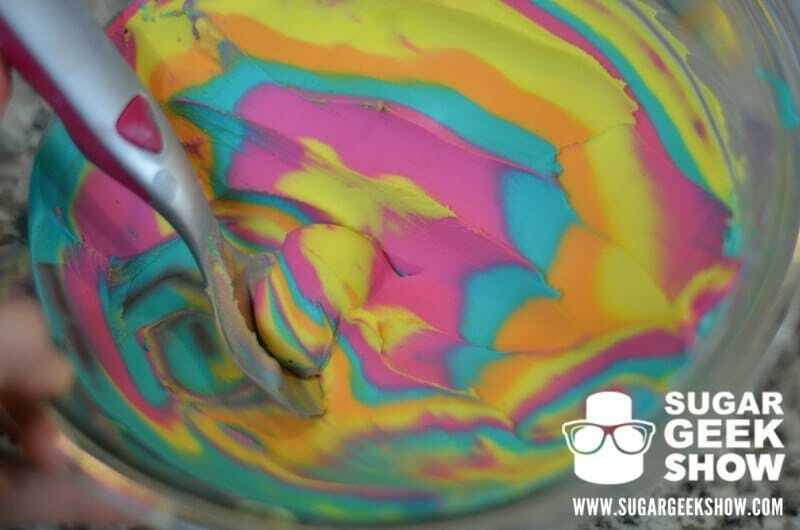 Makes you want to ride a unicorn through a rainbow while eating ice cream and who wouldn’t want that? Because the ratio we use to make the ganache for the scoops is just right and is a perfect consistency to mimic scoopable ice cream. The consistency of the second ganache allows for the awesome melted drip effect and looks amazing. You could just use a real waffle cone but why be restricted to the standard size? 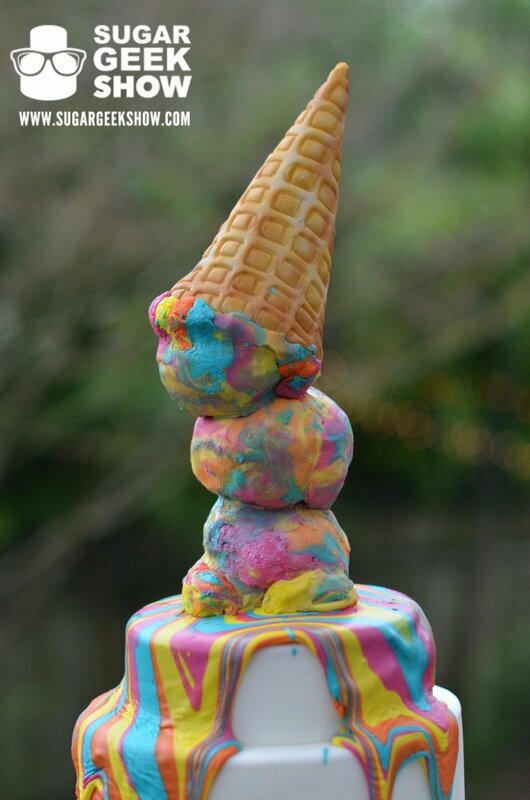 ice cream cake class will teach you how to make your own realistic cone at any size. Re-creating food cakes is so much fun because it doesn’t have to be perfect because food isn’t perfect! In fact, almost nothing in life is so those little added textures, color differences and variations actually add to the realism. Embrace them and have fun with it! 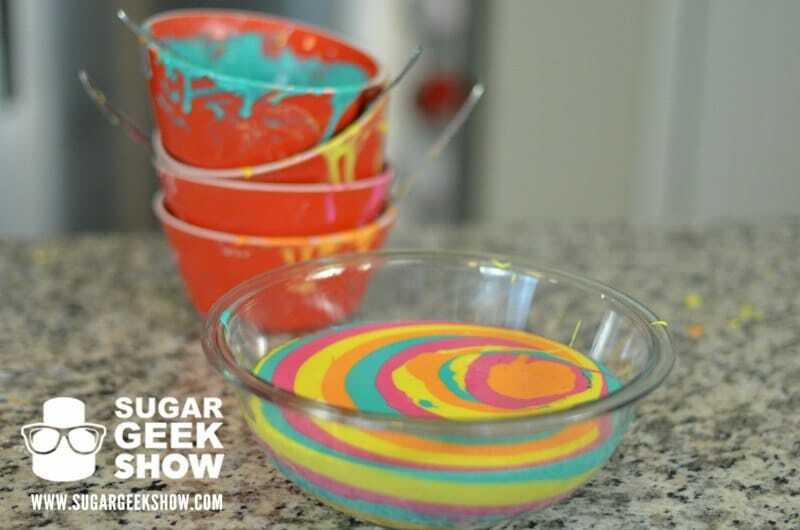 This Ice Cream Cone Drip Cake Tutorial is available for paid members of The Sugar Geek Show, sign up here for this and many other amazing tutorials! Want a freebie? 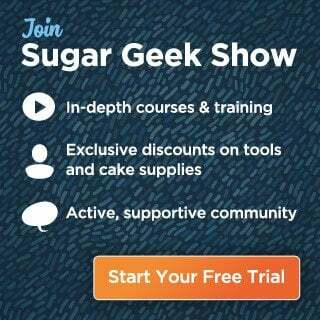 Check out this fun and easy Drip Cake Tutorial for free. You’ll learn the basics of how to pull off this technique, and it’s very easy for beginners. 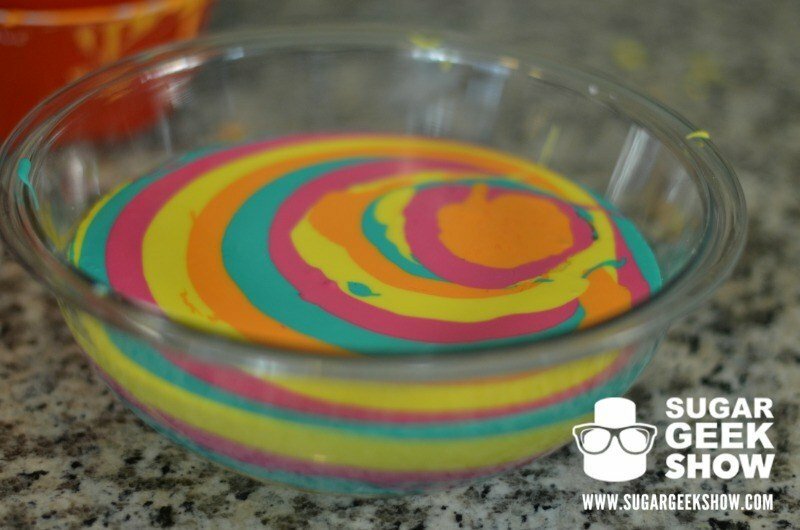 A simple cake with the drip technique will wow your friends and family.